Instant Offers is the latest disrupter in the real estate industry. And just because it is new technology, don't assume that it is going to benefit all consumers. This strategy was pioneered by a company called Open Door several years ago. They are still around, but they do not serve the Nashville market. Since then, several companies have followed their lead including Zillow and RedFin. While each of these services are somewhat different, they have one thing in common. They are best designed for the consumer who values convenience and is willing to pay a premium for it. The problem is that this convenience comes with a hefty price tag. Some of it is in the additional fees that you pay for these services. And the rest of the loss comes in taking less than market value for your home. So if you are willing to pay more while getting less for your home, then Instant Offers may be the best service for you. However, I am guessing that most of you don't want to pay more to receive less money in the bank. Some of the Instant Offer providers will give you a Competitive Market Analysis [CMA] of your home. However, do not confuse that with market value. Market value is the highest offer an able buyer is wiling to pay you for the home. I've done 1000’s of price opinions as a Real Estate Broker, and most of them were for my institutional clients like banks, asset managers and loan servicing companies. And 98% of the time, I am within 1 percent of the eventual sales price. Occasionally, someone will be willing to pay significantly more than your home is worth. It might be their dream home or they just might want the location. Either way, if you don’t expose your home to the market, you’ll never know the true value. And, it’s not just the big companies that are doing this. The "We Buy Homes” guys have been doing something similar for years. Just on a smaller scale. 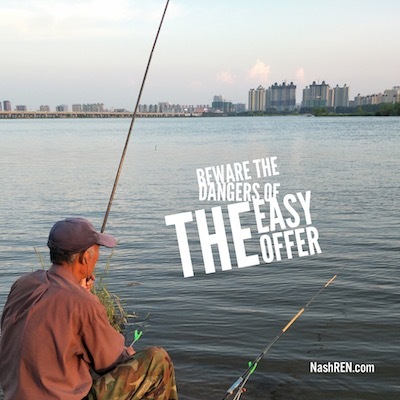 So, if you get an unsolicited offer on your home, then think twice about it. If you would prefer to get an unbiased opinion of your home complete with all of the data, then pick up the phone and give me a call. Gretchen and I are here to help you. The Daily Deal in Nashville is my latest, Bank-Owned listing in Pleasant View. This home needs some renovation, but would make a great investment or starter home. It sits on one acre and is listed for $115,000. Steve and Gretchen may be the most trustworthy and competent Real estate brokers in Nashville. Do yourself a favor and give them a call.